We’d love your help. Let us know what’s wrong with this preview of A Teaspoon of Trouble by Shirley Jump. Type-A chef Carolyn Hanson has walked away from her job at a trendy NYC restaurant after an abrupt family tragedy. Now, as a guardian to her four-year-old niece, Emma, and a very disobedient mutt – kids and dogs are so not her skill set – moving back to Marietta, Montana seems the best temporary option. But when confronted by her parents’ declining health, Carolyn has to f Type-A chef Carolyn Hanson has walked away from her job at a trendy NYC restaurant after an abrupt family tragedy. Now, as a guardian to her four-year-old niece, Emma, and a very disobedient mutt – kids and dogs are so not her skill set – moving back to Marietta, Montana seems the best temporary option. But when confronted by her parents’ declining health, Carolyn has to face reality. And she’s going to need some serious help. So who better to ask than Matthew West, a blast from her high school past… and as hunky and helpful as ever. To ask other readers questions about A Teaspoon of Trouble, please sign up. A TEASPOON OF TROUBLE by Shirley Jump is the first in The Bachelor Bake-Off series all set in Marietta, Montana and written by various authors. This is both a funny and heartbreaking contemporary romance that is an enjoyable read. Carolyn Hanson left small town Marietta and her high school boyfriend in her rear view mirror after graduation for her dream of being a top chef in NYC. For ten years she is singularly focused and is about to realize her dream and be named the sous chef of a trendy Manhattan restaurant when she gets the call that her sister and husband where killed in a car crash. What she finds completely surprising is that her sister named her the guardian of her 4 year old niece, Emma and her puppy, Roscoe. She returns to her hometown hoping her parents will take Emma, but they are devastated with grief and barely functioning. Matthew West has stayed and flourished in his home town of Marietta as a small animal veterinarian. When a beloved first responder is killed, the town proposes a Bachelor Bake-Off to raise funds to build a Boys & Girls club in his memory. Matthew enters to help, but he can barely boil water let alone bake. He is shocked when his old girlfriend walks into his clinic with a little girl and puppy in tow. Carolyn and Matthew make a deal. They will swap their talents to help the other out for the time Carolyn is in town. Carolyn will teach Matthew how to bake and Matthew will teach Carolyn how to train Roscoe. When the old sparks start to fly, Matthew begins to hope that Carolyn will stay in Marietta to raise Emma and be a part of his life again. I laughed as much as I teared up while reading this story. It is well balanced between fun with the dogs, Emma and learning to bake with the grief Carolyn and her family were dealing with, not always well. At first, Carolyn came across as self-centered, but when you learn more of her fears and grief, you begin to empathize with her and watch the growth of her and Emma’s relationship. I felt the author handled the scenes where the family dealt with their grief were realistically written. This second chance story leaves you with a HEA smile and is well worth your reading time. I don't think there is anything necessarily wrong with this book, it just isn't the book for me. Carolyn Henderson's sister and brother-in-law have died and she has been left as the guardian of her young niece and an exuberant puppy called Roscoe. A disciplined chef, Carolyn has no room in her home or her life for children or animals and she finds it impossible to connect with her niece or control the puppy. She tries to dump her responsibilities onto her parents, but they refuse to ta DNF at 52%. Carolyn Henderson's sister and brother-in-law have died and she has been left as the guardian of her young niece and an exuberant puppy called Roscoe. A disciplined chef, Carolyn has no room in her home or her life for children or animals and she finds it impossible to connect with her niece or control the puppy. She tries to dump her responsibilities onto her parents, but they refuse to take their grandchild on full time. Matthew West is the vet in Carolyn's home town. The two of them were childhood sweethearts until Carolyn dumped him and left for the big city. He can't believe it when she comes back to town with a small child and puppy in tow. Despite being practically perfect in every way, Matthew can barely boil a kettle, which is a problem because he has been entered into the Bachelor Bake-Off, so he offers Carolyn a trade. He will help her train Roscoe if she teaches him to bake a cake. I found Carolyn a hugely unsympathetic character. I get that she felt lost and out of her depth with a small child but it's her niece FFS - man up! Surely she must have spent some time with her as a child? If not, there seem to be more family issues. By contrast, Matthew was a paragon of virtue. I found it all vaguely uncomfortable - a form of career woman shaming. By halfway nothing really seemed to have happened except Matthew and Carolyn alternately wringing their hands and bemoaning fate. A Teaspoon of Trouble is part of Bachelor Bake-Off, a series penned by multiple authors set in Marietta, Montana. This entry brought high-school sweetheart Carolyn Henderson and Matthew West back together after their split up at the school's parking lot ten years ago. Matt was now one of the town's small animals Vet and Carolyn a renowned sous-chef in Manhattan. She was only back in town to figure out what to do after her dead sister appointed her as guardian to her four year old niece. I was set to love this story! Second chance romance, small town, cute kid and adorable puppy! There's more than enough potential, right?? Unfortunately, after such promising start, as the story progressed I found myself disliking the character. Make that characterS, as Matt was almost as bad as Carolyn in some cases. The story was told in alternate POVs from both character's view. The good thing about Matt was that he's the kind of guy who didn't hold grudge and saw things in positive way. From his eyes, Carolyn sounded almost like an okay woman, struggling with her own grief yet trying her best in a difficult situation. However, Carolyn's own POV gave me impression that she was a callous and selfish person. Her parents were no help; in fact they left me thinking: no wonder she turned out like this the way her parents treated her. So yeah, this first entry to Bachelor Bake-Off series was not much of a success for me. Not a total bust, as there's still heart-wrenching or adorable moments here and there involving the kid and puppy; and the writing is far from bad. I guess, after a while, I just got tired of Carolyn's hot and cold attitude toward Matt and her unclear plan for the future. Personally, I think this story could be trimmed into shorter pages as to alienate boredom from said endless hot and cold. And perhaps work on the ending a bit. As much as I like the ending - yes, that last few pages did lift up a bit of a point from me - it could tweak a bit better, imho. It's a sweet romance, but very repetitive and I had to stop reading at 32%. While the blurb sounded something right up my alley I just wish the story played out a little better. Maybe I will pick this story back up at some point but as of right now I had to DNF it. I would like to thank netgalley and Tule Publishing for a free copy of the book in exchange for an honest review. It's a sweet romance, but very repetitive. Also the idea that a women who is driven by work and doesn't want children secretly wants to play happy families is a very backward idea. Carolyn finds herself a guardian of her niece and Pet and moves back to Marietta , Montana. Enter a man from her past to assist with the transition and potentially her future. A new addition to the Marietta , Montana town and guaranteed to cause chuckle and sighs. Waiting for more in this new series. I think this was a sweet second-chance romance, but it just wasn't for me. I think it explained twice on every page that Carolyn was a NYC chef and not a maternal person. It was so repetitive that I contemplated giving up about ten times just within the first couple chapters. Emma was cute and Roscoe was the perfect pet for her, but I just couldn't really get much happier about the book than that. Matt came off as whiny. Seriously, how many times do you need to hear someone say they weren't stay I think this was a sweet second-chance romance, but it just wasn't for me. I think it explained twice on every page that Carolyn was a NYC chef and not a maternal person. It was so repetitive that I contemplated giving up about ten times just within the first couple chapters. Emma was cute and Roscoe was the perfect pet for her, but I just couldn't really get much happier about the book than that. Matt came off as whiny. Seriously, how many times do you need to hear someone say they weren't staying before you start hearing the desperation in your own voice? Not sure if I'll read the other books in the series even though they are written by different authors. Thanks to netgalley.com for the ARC of this book. This story was predictable and repetitive. I understood from the first chapter she was a NYC chef and didn't want to be back in Montana. But it just kept going like I forgot what I read two pages ago, it was that and the characters and story were so predictable. The blurb summed up the whole book and I felt I didn't need read the book since the blurb was better then the book. Carolyn gets the call that everyone dreads to receive. The one that tells her that her sister and her husband have been killed in a car accident. Then she receives the call from their lawyer that she has been made the legal guardian of her sister's 4 year old daughter and her dog roscoe. Carolyn is afraid to take risks and she knows nothing about raising kids or dogs for that matter. She heads home to Marietta thinking that she will get her parent's to raise Emma for her. She discovers their heal Carolyn gets the call that everyone dreads to receive. The one that tells her that her sister and her husband have been killed in a car accident. Then she receives the call from their lawyer that she has been made the legal guardian of her sister's 4 year old daughter and her dog roscoe. Carolyn is afraid to take risks and she knows nothing about raising kids or dogs for that matter. She heads home to Marietta thinking that she will get her parent's to raise Emma for her. She discovers their health is declining fast. So she now realizes that she has to raise Emma on her own. She runs into her high school sweetheart Matt and old feelings start to surface again. This was a good start to a new series Bachelor Bake-Off. I haven't read the author recently but I really enjoyed this one. Carolyn Henderson lived in New York and worked as a sous chef at a top notch restaurant. She's up for promotion to head chef, the fulfillment of a dream she's had since her grandfather taught her how to cook before he passed away. It was the reason she'd left Montana and the man she loved behind. Now her sister and brother-in-law have been killed in an accident, leaving behi This was a good start to a new series Bachelor Bake-Off. I haven't read the author recently but I really enjoyed this one. Carolyn Henderson lived in New York and worked as a sous chef at a top notch restaurant. She's up for promotion to head chef, the fulfillment of a dream she's had since her grandfather taught her how to cook before he passed away. It was the reason she'd left Montana and the man she loved behind. Now her sister and brother-in-law have been killed in an accident, leaving behind a four-year-old daughter, Emma, and a fifty pound dog named Rosco. When Carolyn learns she's been named Emma's guardian she's stunned. She knows nothing about being a mother, had never wanted kids. Whatever had her sister, Sandy, been thinking? She returns to her home town, hoping to enlist her parent's help with Emma, but her parents are barely functioning, devastated with grief, seeming to have aged before Carolyn's eyes. She also meets up again with lost love, Matthew West. Matt's heart was broken when Carolyn walked away without a backward glance. He'd been busy planning their life together only to learn she had no intention of staying in Marietta. He'd tried to move on, had even gotten married only to have the relationship end in divorce. Therefore, he's shocked when Carolyn brings her dog into his veterinary clinic with a child in tow. What was she doing back when she swore not to return and is it possible this time she'll stay? It seems as though Emma gives her a good reason to remain in town but every time he broaches the subject Carolyn runs away. So how can he convince her this time to stay? At first I wasn't sure I was going to like Carolyn. She seemed so much more concerned about her promotion than she did her niece. However, the more I read I came to realize she was grieving too and had no idea how to be a mother to Emma. She'd been thrown into the role and was trying to figure out how she could juggle her high stress job while making sure Emma was well taken care of. She was fighting the fact she might have to let go of one in order to hang onto the other. And then there was Matt and the renewed feelings he inspired. She knew she still loved him but her life was in New York, wasn't it? I breezed through this in one sitting. Hated to put it down. My heart went out to little Emma as she struggled with losing her mommy and daddy. Matt was so good with her and was always there helping Carolyn through the rough spots. This one I would definitely recommend. This is an awesome sweet read that is filled with emotion. The last person Matthew West expects to see in Marietta is Carolyn Henderson. Yet here she is in his veterinarian office with an unruly dog and a little girl that is the sweetest thing Matt has ever seen. Carolyn was his high school sweetheart but she broke his heart on graduation day when she let him know he wasn't enough to keep her in Marietta. She had plans and didn't look back when she left town. They may never be close again but th This is an awesome sweet read that is filled with emotion. The last person Matthew West expects to see in Marietta is Carolyn Henderson. Yet here she is in his veterinarian office with an unruly dog and a little girl that is the sweetest thing Matt has ever seen. Carolyn was his high school sweetheart but she broke his heart on graduation day when she let him know he wasn't enough to keep her in Marietta. She had plans and didn't look back when she left town. They may never be close again but they each have something the other needs. Striking a deal to help each other out has them spending a lot of time together. Will they be able to walk away from each other again? This is a sweet, simple romance about a young New York City chef on the cusp of greatness when suddenly she becomes the guardian of her orphaned niece and her rambunctious dog. Out of her depth, Carolyn returns to her hometown for a couple of weeks to comfort her parents and get some help with the four year old. She encounters her hunky, divorced high school boyfriend, now a vet, who, unlike her, is great with kids and dogs. This sentimental romance will appeal to its target readers. The reason I This is a sweet, simple romance about a young New York City chef on the cusp of greatness when suddenly she becomes the guardian of her orphaned niece and her rambunctious dog. Out of her depth, Carolyn returns to her hometown for a couple of weeks to comfort her parents and get some help with the four year old. She encounters her hunky, divorced high school boyfriend, now a vet, who, unlike her, is great with kids and dogs. This sentimental romance will appeal to its target readers. The reason I gave it three stars is that the author padded the word count with repetitive introspection. Those who read this short novel in a couple of days or less (like me) will moan "enough already" with the constant repetition of why the chef and the vet think they can't be together, despite their mutual attraction. If you read verrrrry slowly (say, a chapter a week), and welcome the reminder, this will probably not bother you. 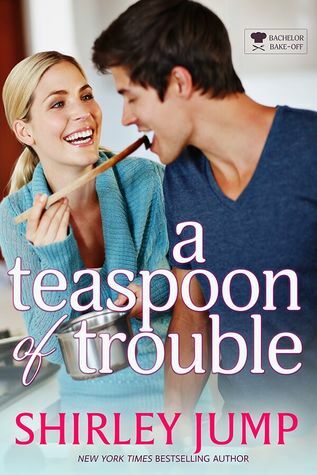 A Teaspoon of Trouble by Shirley Jump is book number number one in the Bachelor Bake-Off series. This is chef Carolyn Henderson and vet Matthew West's story. One day Carolyn is a chef with her dream job almost a reality then she is responsible for her four year niece and a large rowdy dog after a family tragedy. Carolyn is back in Marietta so she can figure out how to handle the changes in her life. Matt and Carolyn dated in high school but Carolyn was so ready to leave Marietta that she walked aw A Teaspoon of Trouble by Shirley Jump is book number number one in the Bachelor Bake-Off series. This is chef Carolyn Henderson and vet Matthew West's story. Matt and Carolyn dated in high school but Carolyn was so ready to leave Marietta that she walked away from their relationship. Their paths cross again when Carolyn needs help with her niece's dog. Matt agrees to help Carolyn with the dog if she will help him with the Bachelors bake-off. Will they get a second chance at love? A Teaspoon Of Trouble, the first story in the Bachelor Bake-Off series, is a lovely sweet romance featuring among other things an untrained puppy and a very sad little girl. I liked all the characters in this story. I felt so sorry for Carolyn and her family as they adjusted to life without her sister. I particularly felt for Carolyn who was faced with tough decisions around her career and her niece, though Matt is a great foil for her and perfectly suited to helping resolve her issues. This is a A Teaspoon Of Trouble, the first story in the Bachelor Bake-Off series, is a lovely sweet romance featuring among other things an untrained puppy and a very sad little girl. Kicking off the Bachelor Bake Off series in Marietta, Montana is a sweet story about loss, family and most of all love, old and new. Ms Jump has created a wonderful story depicting how the small town can draw you in, while for some push you away...the latter based on fear. The emotions run high in this first book, setting the bar for the remaining books in the series to match its intensity and the level of familiar comfort that runs under it all. My appetite has been whet (not just my reading ap Kicking off the Bachelor Bake Off series in Marietta, Montana is a sweet story about loss, family and most of all love, old and new. Ms Jump has created a wonderful story depicting how the small town can draw you in, while for some push you away...the latter based on fear. The emotions run high in this first book, setting the bar for the remaining books in the series to match its intensity and the level of familiar comfort that runs under it all. My appetite has been whet (not just my reading appetite either...my stomach rumbles just from the talk of the bake off) for the remaining stories and the reoccurring characters that appear throughout. After recently reading Bittersweet by Sarina Bowen, I went on the hunt for other novels with chef main characters. Unfortunately, this is my first Shirley Jump book and probably my last. Carolyn was annoying and I don't know what Matt sees in her. If I had to read one more line like, "I can whip up a 10 course meal for 100 people but I can't possibly emotionally connect to the world around me" I was just going to lose it. Overall the story was fine and the writing was good, I just wasn't feeling it. It did get me in the feels a few times, so there's that. I enjoyed this book. Carolyn's sister Sandy and her husband were killed in a car accident. They made Carolyn the guardian of their only child Emma. I could feel the sadness and loss the parents felt, the confusion Carolyn felt about suddenly becoming a mom. I did feel that the story did not need to go on for as long as it did. I would recommend this book to anyone who enjoys a good story. This is the first book I’ve read by this author. I found the story enjoyable, covering a young love lost in the past, a family separated by more than just miles, giving all to follow your dreams. The family reconnects after a tragic loss, and young love just might get a second chance in the present time, especially if Carolyn can dig deep into her fears to discover what her heart wanted all along. A second chance romance and a coming home story. Sweet with good characterisations. Carolyn isn't a "natural" mother and struggles with her new role. Matt has somewhat forgiven Carolyn for leaving him. And together they understand the past is what made them who they are and now they need to move forward. A good story with the Heroine putting the child first but also learning to accept herself. This wasn’t a bad story but it wasn’t great either. Neither of the characters were all that likeable and I honestly didn’t feel a whole lot of chemistry between them. I just never really connected to their story. They could have walked away as friends and I wouldn’t have felt that either of them were missing out on much. It is a great book full of love,sadness and a lot of emotions It is about a little girl losing her parents. It shows all the emotions the family goes through. A very sad story. A new to me author. Book one in A Bachelor Bake-off romance series. A enjoyable book one in a new series. Great character development for this fast paced book. I'm looking forward to reading what is next up in this series. Likeable characters, a heart-wrenching premise, and good writing add up to a good read. The heroine is a little slow to see the truth and changes a little too abruptly to rate 5 stars, but this is definitely worth a few hours. A super, quick to read second chance romance. The bake-off backdrop is fun, but there's a heartbreaking storyline too. With likeable protagonists, a cute small child and a crazy dog, A Teaspoon of Trouble is an enjoyable book for a Summer afternoon. A sad but sweet story about facing fears after your life has been changed by tragedy. Contemporary romance in nature. Look for her Sweet and Savory Romance series, inc New York Times and USA Today bestselling author Shirley Jump spends her days writing romance and women’s fiction to feed her shoe addiction and avoid cleaning the toilets. She cleverly finds writing time by feeding her kids junk food, allowing them to dress in the clothes they find on the floor and encouraging the dogs to double as vacuum cleaners.